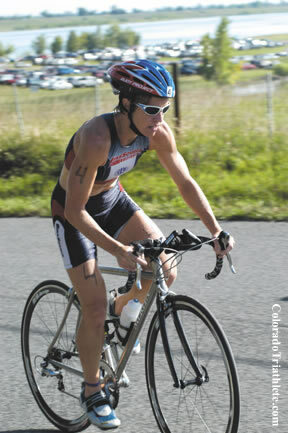 Fall 2005, Boulder – After a slow start to the season, Boulder’s Amanda Lovato found success in two of the area’s top races, right here in town. First, on July 24th, Amanda overcame all her rivals on the challenging Boulder Peak bike course to take her first professional victory. 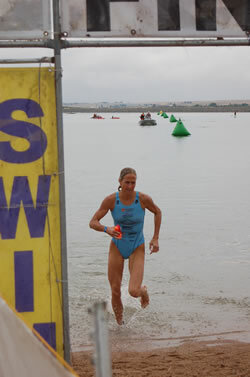 Two weeks later, over different distances, but on a similar course, she managed to back up win number one with an impressive first place at the 5430 long course tri, this time grabbing the lead on the run. 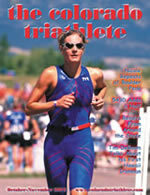 After the dust settled, Colorado Triathlete sat down with Amanda to record some of her thoughts; the interview follows. 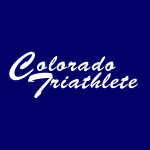 Colorado Triathlete: Your season started out slow, due to a couple of health problems, can you elaborate on those? Amanda Lovato: Yes, after my first couple races this spring, I was diagnosed with asthma. Shortly after that diagnosis (and after putting in a couple of good training weeks: finally feeling good! ), I developed appendicitis. I had the surgery to remove my appendix, which sidelined me for another couple weeks. By the time I was healthy and able to train, I had to refocus my whole season. CT: At that point you decided to race Boulder Peak and the 5430? AL: Well, I decided to do Boulder Peak last-minute. I had only been feeling good in training for a little over a week, and Barry Siff sort of talked me into racing. I have had great races there in the past, so it wasn’t hard to convince me! However, it wasn’t until after the Peak that I decided to do 5430. 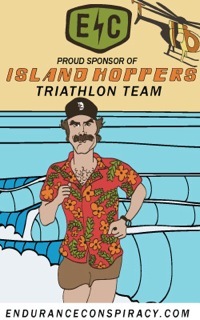 Basically, it seemed to fit better into my newly revised plan to race Ironman Wisconsin at the beginning of September. CT: Tell me a bit about your race at Boulder Peak, and why that win was so special to you. AL: I have always loved doing short-course races, and in particular, the Peak. It’s got such a tough bike course, which really suits me. Plus, I do so much training on the course, the familiarity really helps out. The win was very special for a few reasons. First, it was my first win as a professional, which was nice. Also, to win here in my home town was a bonus. And finally, I think it really gave me confidence that my training was right on track, and that I was getting much stronger. CT: At what point did you realize that you had a shot at winning? AL: I came out the water about five minutes down from the leaders. My swim was ok, but I knew that I had to really hammer the bike, in order to make up that ground. As soon as I got going, I could tell that I was going to have a great bike ride. I just felt so strong. I started getting splits from the leaders, and I realized I was gaining pretty well on the others. Once I took the lead, out on 63rd, I knew it was my race to lose. 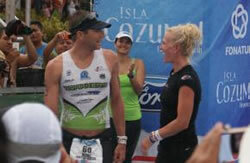 CT: Was there ever a thought that you could hold off Simon Lessing to win the male/ female challenge? AL: Oh no! I know how fast Simon is, especially at short races. I knew it wasn’t a matter of if he’d catch me, but rather when he’d catch me! CT: Going into the 5430, against some of the same women, were you confident you could win again? AL: I have a lot of respect for the women I was racing that day. And with the longer races like that, I am well aware that anything can happen. However, I really believed that if I put together a solid bike-run, I’d be in contention for the win. CT: Tell me a bit about how that race played out for you. AL: It was similar to Boulder Peak: I came out of the water about five minutes down, and immediately began to put the pressure on the bike. I have recently gotten a new time-trial bike: the Javelin Barolo, and it is an incredible bike! I rode pretty hard for the first loop, and by the end of that loop, I had caught Monica Caplan Byrn. That was a good sign, as I know how strong she is on the swim and bike. After passing Monica, I set my sights on the leader: Amanda Stevens. CT: At what point did you catch her? AL: It wasn’t until about mile three of the run that I was able to catch her. Even though I had taken the lead, I wasn’t really able to relax right away: last year’s champion, Claire Murray was behind me, and I watched her run away with the race in ’04. I kept running hard until the last few miles, when I got a split on second place. At that point, I was able to soak up the feeling of winning! CT: You had an impressive couple weeks, how did you celebrate? AL: Well, I had my eyes on a pair of Ugg boots; called the Fluff Mama… they come in pink! I told myself that I had earned them, so I splurged and bought them! Other than that, I had a nice dinner out with my husband, who managed to watch my second win, seeing as how he missed the first!